China's hog price is expected to stay at high levels at least until the middle of 2017 due to short supply, providing opportunities for foreign suppliers, analysts said. China's hog price skyrocketed at the start of 2016, reaching an all-time high of more than 20 yuan per kilogram, as listed in a report Rabobank sent to the Global Times on Thursday. Hog prices did see a slight drop in June. 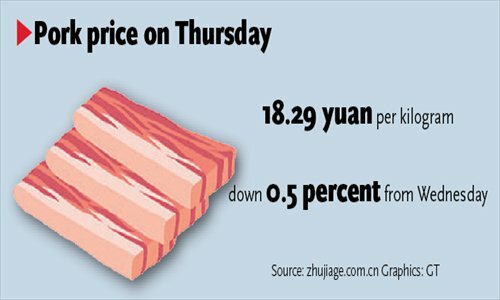 The latest data released by professional pricing website ­zhujiage.com.cn showed domestic hog price was 18.29 yuan ($2.74) per kilogram on Thursday, down 0.5 percent from the day before. "Hog prices fell in June as farmers rushed to sell their pigs out of panic that processors will refuse their pigs if they are too fat," Pan Chenjun, a senior animal protein analyst at Rabobank, told a press briefing on Wednesday. But Pan said this will end soon because hog supplies remain limited. "We expect that hog prices will likely climb to the peak of the current cycle at 22 yuan per kilogram in the third quarter of 2016 due to tight supply," Pan said. In February and March of 2016, the quantity of piglets and sow herd size declined to a historical low due to a combination of farmers' losses and government measures to close down unsuitable farms, Pan said, noting that the hog supply will likely hit bottom between September and November because of the 5-6 month fattening period. Heavy flooding in more than 10 provinces and regions in China have also been a factor in lower pork production numbers, Ma Wenfeng, a senior analyst at Beijing Orient Agribusiness Consultant, told the Global Times on Thursday. The recent heavy rainfall that has ravaged ­provinces and regions in Central and East China has affected millions of animals, including pigs, cows and fowls. In East China's Anhui Province alone, an estimated total of 53,110 pigs, 2,347 cows and 7.28 million fowls were dead or flushed away by 5 pm Tuesday, people.com.cn reported. The hog prices may further rise if farmers sell their pigs and delay making replenishments, Pan said. 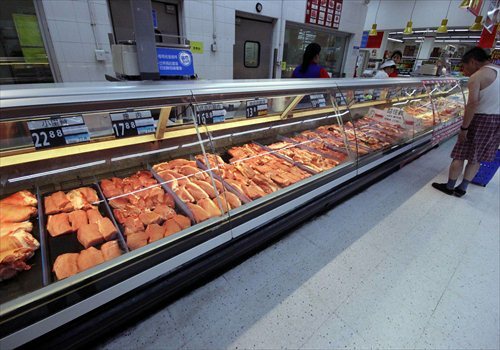 With the combination of rising prices and ­declining pork production, China may need to increase imports to strengthen supply in 2016, analysts said. "In total, we expect China to increase pork imports by 30 percent to approach 2 million tons. The EU, the US and Canada are well positioned to increase exports to China given their availability of product and the adaption of their production systems in ­response to China's ractopamine-free policy," Pan said. China's pork imports have already been growing fast this year. In the first five months of 2016, China registered imports at 600,000 tons, up 120 percent year-on-year, Ma said. Beyond 2016, China will likely maintain its level of imports, even when local production recovers in 2017 due to its consistent quality and lower price, compared with local production, said Rabobank's research report. In the second half of 2017, falling domestic prices will create consolidation in the industry while squeezing small farmers out of market, Pan predicted. "Currently, major Chinese farming companies account for a small market share as China's farming is highly decentralized," Ma said. In the next five years, the country's top 10 farming companies are expected to account for 12 percent of the total hog supply, 7 percentage points higher than current levels and middle-sized family farms with more than 500 hogs each year will dominate production, according to Rabobank.